namely William Clark and Ann Scott. Brief description of the programmed activities. These were numerous but the ones that will remain in the memory for years to come are the reaction of a congregation of almost 600 people to their first sight of the pulpit fall and the cross crafted by William's son, Raymond, that St Anne's had sent as a gifts for their new church and the buzz of activity in and around the church of St Andrews every day of the week. This church in a city centre is always active and making a statement about the Christian faith: there are group meetings, social events and opportunities to worship or reflect constantly on offer. 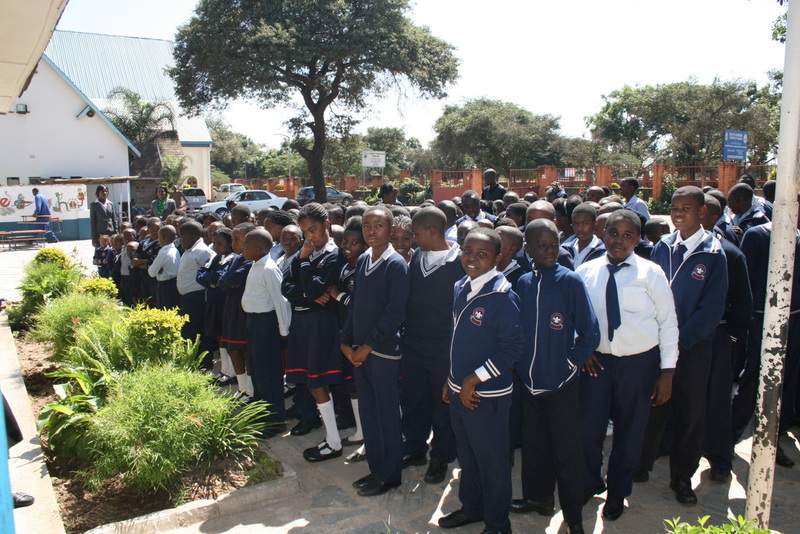 The school is housed in the same compound where children's voices, and music groups practising can be heard. The visit to the school was very encouraging – all of the children there were so eager to learn and to share their knowledge. They wanted to know about Scotland and asked very searching questions about the Independence Referendum. The ministers of the Presbytery engaged in a Retreat during our visit and we were very privileged to join them on their last day. The debates in which we were involved were Ministerial Code of Ethics and Concern over World Environmental issues. These sessions were soul searching and the debate wide- ranging. The overall impression was that we were amongst a group of ministers and elders who had genuine concerns and were trying to make an impact in both areas. It was a joy to be invited to stay with members of the congregation, be involved in family meetings and other events. The warmth of this congregation and their interest in the Twinning was at times overwhelming. We are indebted to St Andrew's for the accommodation and hosting of meals throughout as well as the visit to Livingstone and the Falls. After two very busy weeks spent with groups of people and being involved in noisy and exciting activity, we were taken by Rev. Alex Mwalilino to visit a retired minister, Rev Samson Kapongo and his wife Jane. They live in the village of Kafue about an hour's drive from Lusaka. The United Church of Zambia have purchased several acres of land there where retired ministers can have a plot on which to they can build. It is idyllically peaceful. The Kapongos grow their own vegetables and fruit and rear chickens making them almost self-sufficient. It was however the man himself who impressed so much. Rarely in life do any of us have the opportunity to meet men such as him. He was totally at peace with the world and his faith shone from him like a beacon. He had spent a year at St Colm's in Edinburgh several years ago and spoke of his time in Scotland with fondness. It was lovely to hear him reminisce of that and of his ministry in Africa. William will never forget the sight of six brand-new, red motor bikes stored in the gallery of St Andrew's pending presentation to six rural clergy. This is not something seen in many churches. The bikes had been bought by St Andrew's congregation to help in rural ministry. Other lasting impressions include a gathering of hundreds of the Women's Christian Fellowship, all 'bloused' in red blouses at a revival meeting, Bishop Chomba preaching for over an hour in Bemba, the choirs singing. The list of memories is endless! Achievements and/or other lessons learnt. This was the experience of a life time. The folks of St Andrew's welcomed William and me so warmly, shared their homes with us and involved us in family gatherings as well as making sure that we saw and experienced as much as possible of the life of St Andrew's and of Zambia. There were things that caused concern: the high rate of unemployment, the poverty of the majority of the population, the lack of access to education for so many over the age of twelve, corruption, prostitution, the HIV/AIDS situation and the challenge of the other faiths. These issues cannot be ignored in Zambia. As twinned partners we now have a much deeper understanding of the problems facing the UCZ. Whatever the activity in St Andrew's there is always an element of worship, prayer and a short Bible study, The youth groups have a programme of Worship, National history and then fun time. It was a delight to see groups with ages ranging from 3 yrs to 16 yrs joining together in this way. Youth Leaders were not in short supply even if it meant bring their babies with them when on duty. St Andrew's is a very visible centre for worship, social work, education and socialising in the midst of its community. There are lessons to be learnt from this witness to the Christian faith for us here in Edinburgh and with the will and the faith to move forward we too could make a bigger difference even though the problems we face are not identical. The opportunity given by the two visits exchanged by St Andrew's and St Anne's was to see and hear of problems, both social and church, first hand, to experience a different life style, to look at the resources being employed in addressing each other’s difficulties and to get to know people in their own home setting. Understanding, that no amount of correspondence could provide, is the richest part of the visit experience. This will help us to move forward positively with the Twinning between us and has also brought some close and lasting friendships. We reticent and dour Scots have also had a strong reminder that prayer and worship should be at the centre of our lives.